Bin 5 has been a favorite spot of mine for a while, now. When I first stopped in a few years ago, it was all about the food and the atmosphere. I loved the live jazz (Wednesdays and Thursdays), and cozy feel of the small and intimate space. The food was traditional but with a kind of cool spin on things. Back then I met the manager, Danny Ippolito, a young restauranteur who has made excellent service a top priority. He may not have 30 years of experience, but I guess the art of hospitality is something you’re either born with or you’re not. 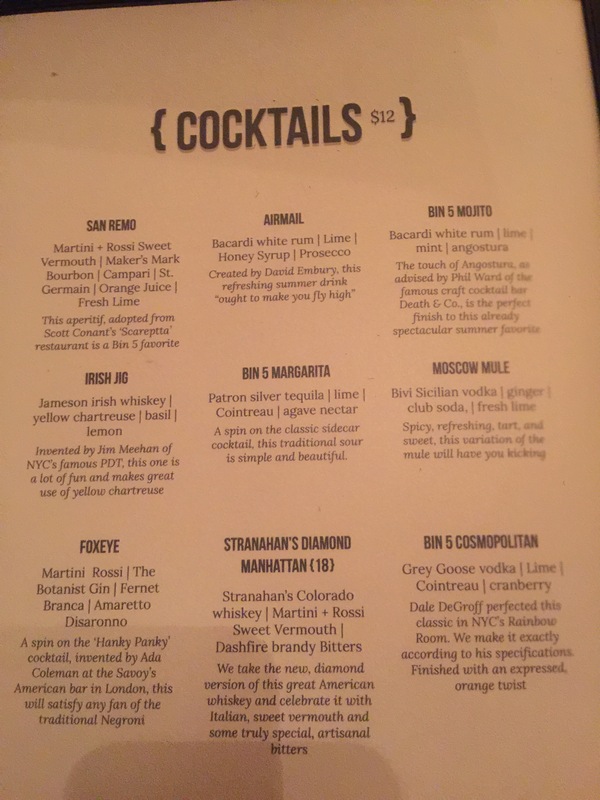 After a stint away from Bin 5, and some intensive mixology exploration, Mr. Ippolito returned a few months back with a cocktail crafting vengeance. The once impressive food, introduced by their former Chef Frank Bilotti, began to pale in comparison to the surprisingly perfect drinks – it’s not something I expect on Staten Island. 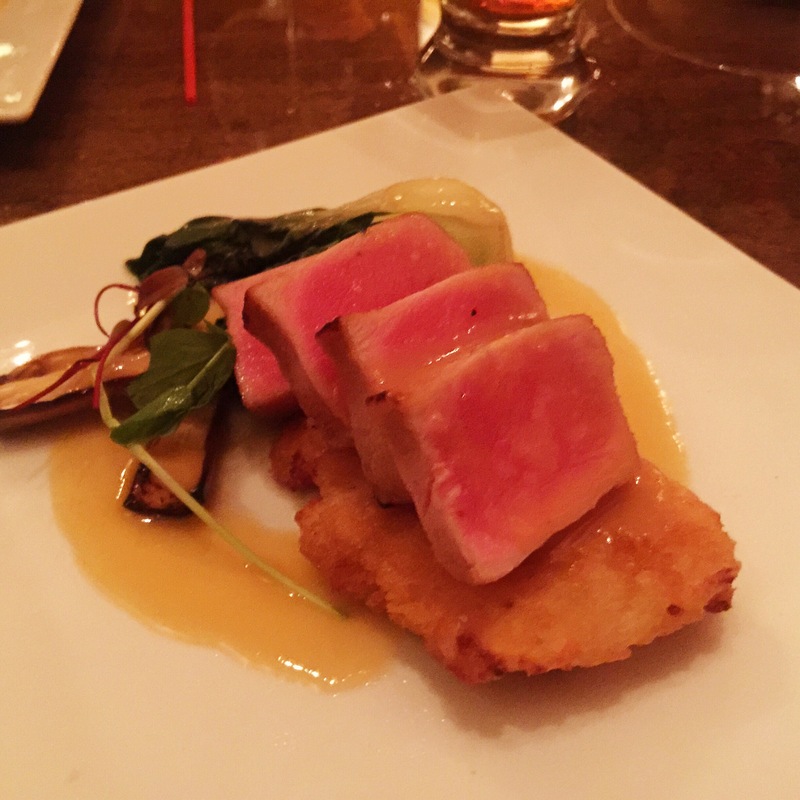 And although Bin 5 won the Staten Island Advance’s 2015 best restaurant, I wasn’t so sure. 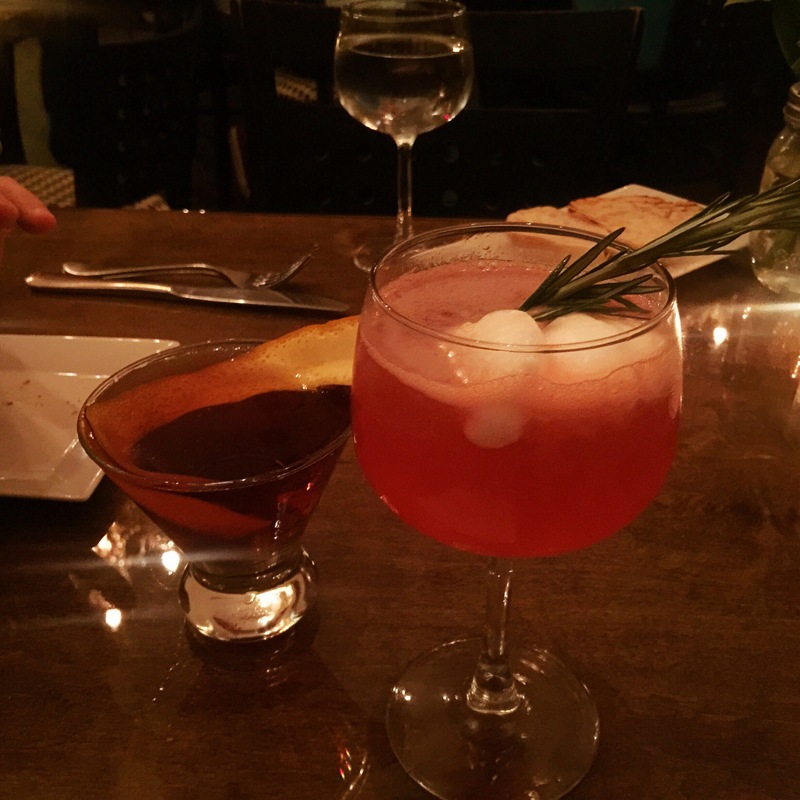 Over the summer, Jason and I went twice and were consistently blown away by the caliber of the drinks – quality we can usually only find in overpriced NYC speakeasies or in hipster Brooklyn. But we were disappointed by the food. So when I learned that Mr. Ippolito was bringing in a new chef, Steven Smith, and completely revamping the menu, I was thrilled. Bin 5‘s previous menu had never changed since the restaurant’s initial opening, and did have some ok options: a strange collection of Italian, Asian, and American inspirations that somehow worked pretty well together. They had a rotation of specials that were always solid, too. It’s not like you were going to come here and ever have a bad meal. 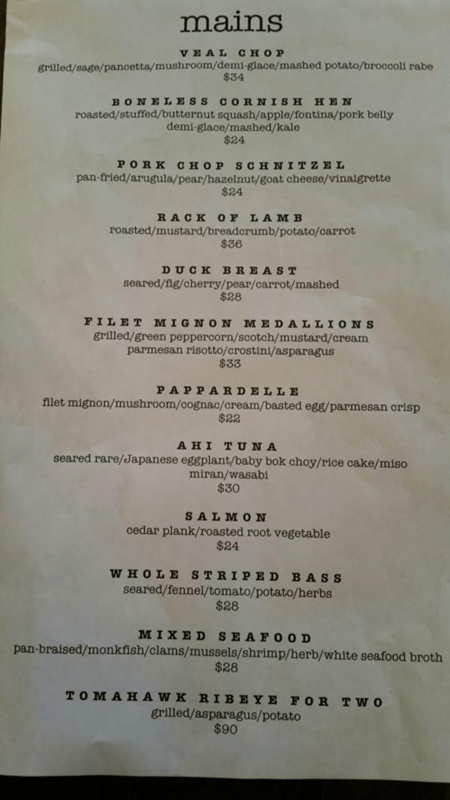 But the menu got stale: a change was needed, and a change has come. In speaking to Mr. Ippolito, you can see, hear, and feel his passion and excitement to have the opportunity to turn things around and put his own mark on Staten Island. He aspires not for wealth or notoriety, but rather to provide a space where people can comfortably eat and drink things that were crafted with love. In between concocting all sorts of delicious combos behind the bar, Mr. Ippolito manages to touch on each table with a genuine interest in the diners’ experiences. He humbly wants to know if something is not right with his food or his drinks because he sincerely wants to make improvements. And that (to me at least) is the sign of a true restauranteur. Bin 5 rolled out Chef Steven Smith’s (formerly of Gatsby’s on the Bay) new menu on September 8th, and I gave them a few days to work out the kinks. But I couldn’t wait long. I made an 8:00 reservation for Friday night. The inside of the place (maybe 14 small tables) was about half full, and the four tables on the back patio (a really nice comfortable space) were all full… so it seemed things were already going fairly well. Jason and I sat down and were warmly greeted by Mr. Ippolito, who at this point knows our preference for gin and bourbon cocktails, and already had recommendations for us. We happily took his suggestions: Jason went with the Foxeye and I did the Negroni Fizz (a special). The Foxeye was delicious; the strange combination of sweet (from the amaretto) and bitter (from the fernet branca) was balanced perfectly. The Negroni Fizz was flawless as well. A traditional Negroni is equal parts gin, campari (nice red color), and sweet vermouth. This was a lighter and fresher take on that, adding some freshly squeezed grapefruit juice for a little tartness, some lemon sorbet for a little sweetness, and a sprig of rosemary for some fragrance (and beauty). To start they brought out a dish of hummus and some warm toasted bread. 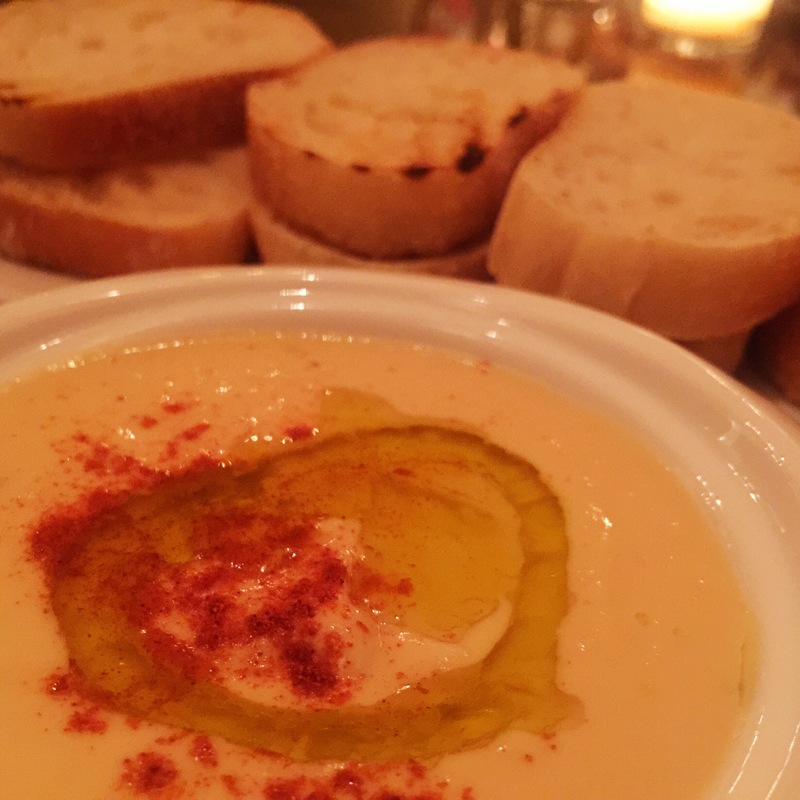 The hummus was fresh – not thick and heavy like store bought varieties – this was almost like a liquid spread with a much more pronounced tahini flavor. 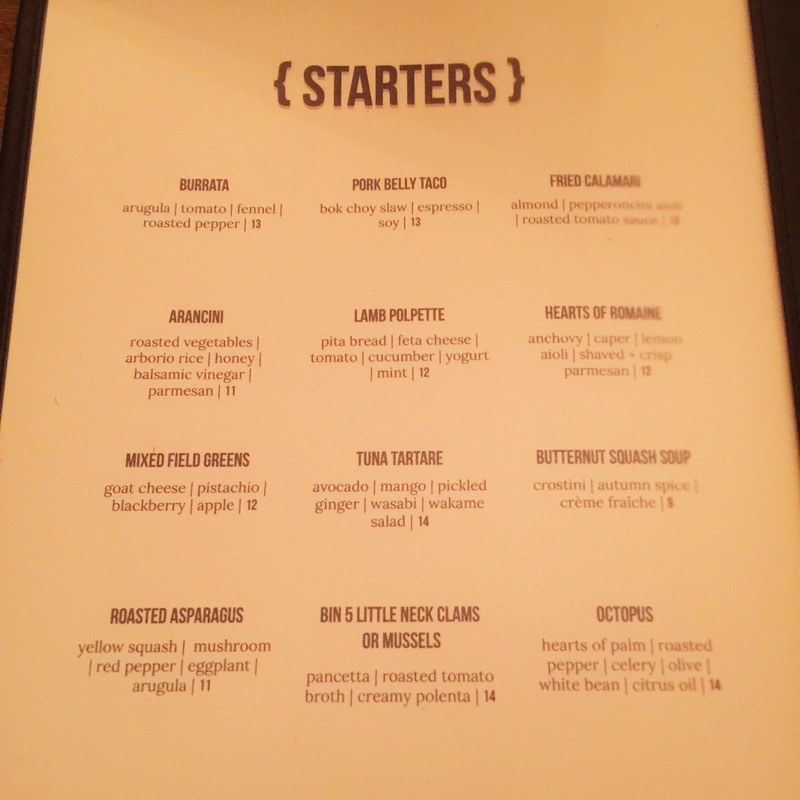 We perused the menu for a few minutes, but as usual were completely overwhelmed; I wanted everything. So I asked Mr. Ippolito if he could just pick the best stuff for us. He was happy to create a tasting menu for us, and we were relieved to not have to debate the many enticing options. 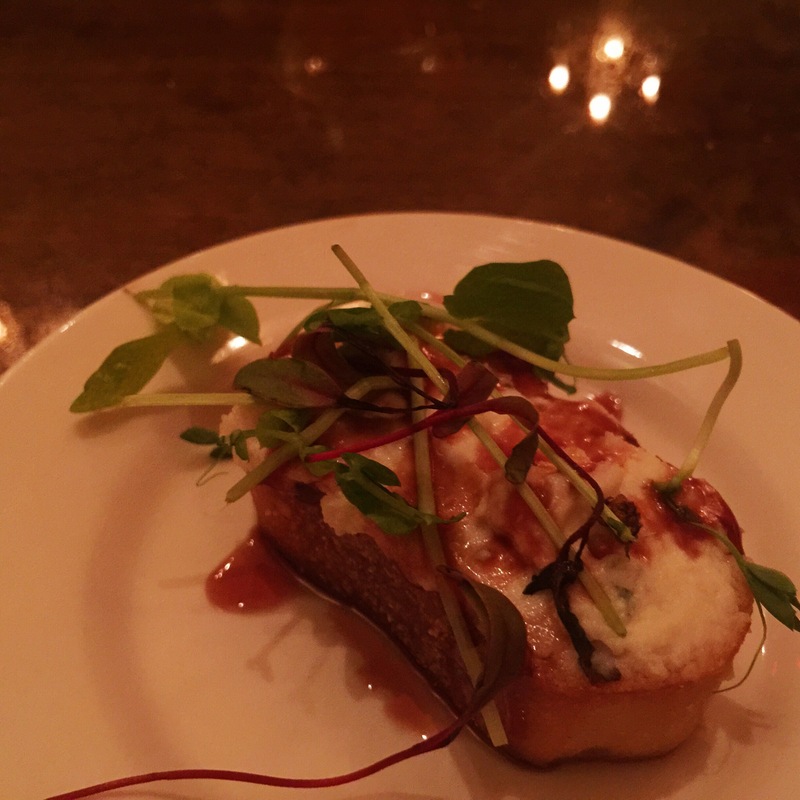 The first thing that came out was a small crostini amuse bouche. This combined goat, mascarpone and gorgonzola cheeses with a honey balsamic drizzle and greens. The honey balanced out the distinct strength of the goat and gorgonzola cheeses. I must say, this little snack was much more delicious and complex than it looked. The only criticism here is that the greens were unnecessary and bulky: maybe better to chop some fresh herbs on top, so they don’t interrupt the physical bite so much and still give some color. Next we had a salad, and this was hands down our least favorite dish. To be fair, this is not the type of salad Jason and I usually choose – we are anchovy loving Caesar salad snobs. So a fruity, nutty salad is out of our usual scope of practice. We found a few errors that can be easily corrected to improve this plate. First, the plate was warm and the greens were wilted. Chilling the salad plates to ensure nice crisp greens would instantly improve the visual appeal of this dish – we really do eat with all of our senses. Next, the apples and pistachios were bulky and hard to eat. Julienned or chopped apples and crushed pistachios would have made each bite easier to eat and more uniform. While this was our least favorite dish, and there were those criticisms, the flavors were great. The goat cheese was mild and had a great creamy texture. 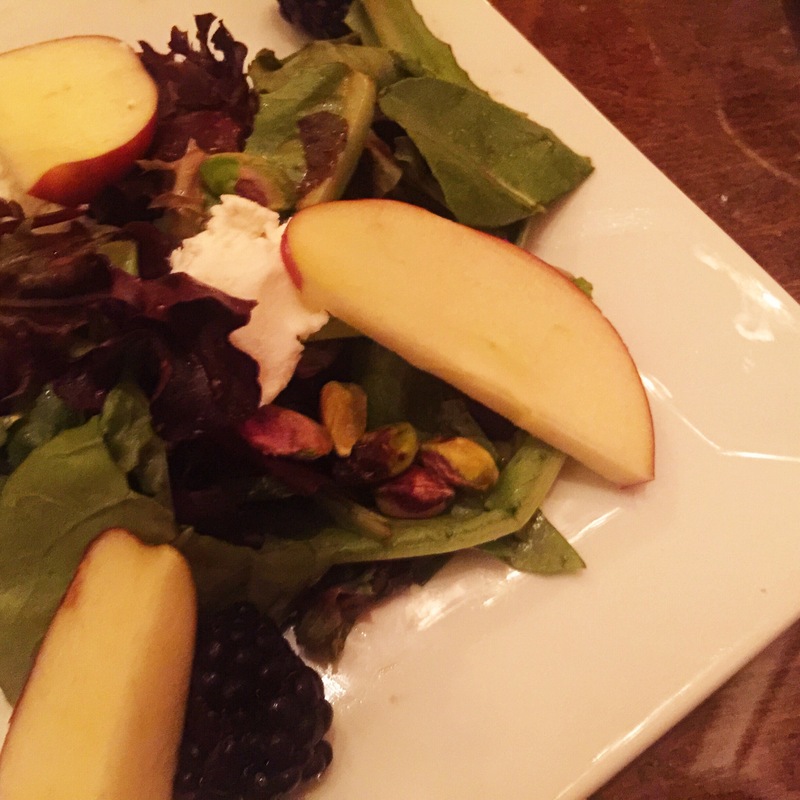 At the end of the salad, I had a chunk of cheese and a bunch of pistachios left, so I ate a forkful of just them, and the pairing of the flavors was awesome. The greens were lightly dressed, just the way I like them. I wish I could have gotten that perfect pistachio, cheese, and apple combo into each bite without such a struggle. After that, there’s really only good and great things to report. We had the burrata with heirloom tomatoes. Jason was weirdly excited to discover that they’d also used fennel, one of his favorite things. The salad also had some cherry tomatoes, roasted peppers, and a creamy balsamic glaze. The little greens on the side were again unnecessary, but didn’t take away from the dish. 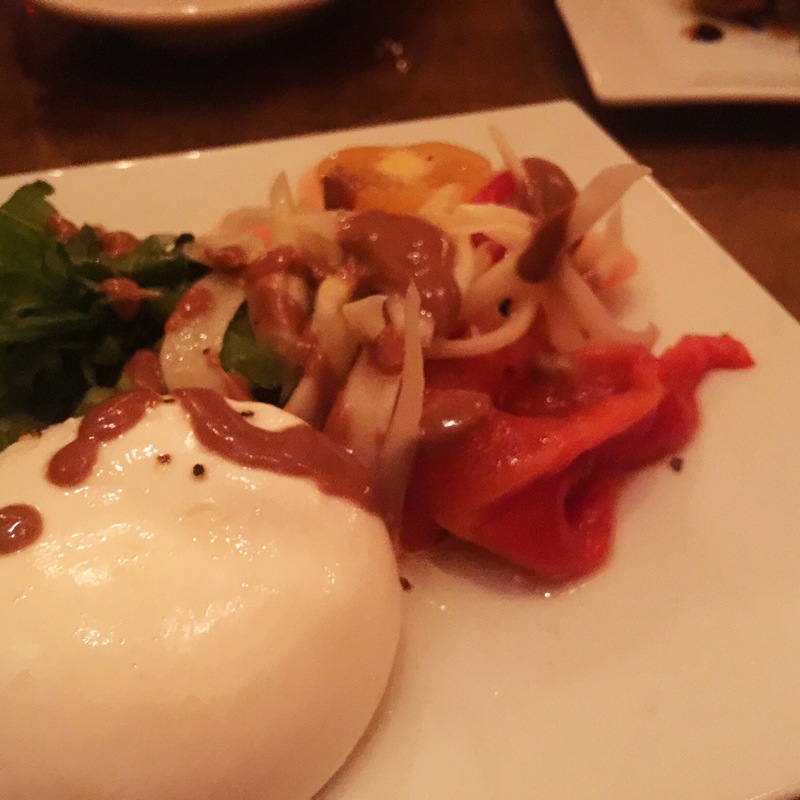 The quality of the burrata was apparent. It was a smallish ball, that didn’t ooze cream when we cut into it. Instead, it was slightly firmer than I usually find burratas to be. The mozzarella was salty while the ricotta inside was sweet and well strained (creamy and smooth without being watery and messy). This was an excellent dish. 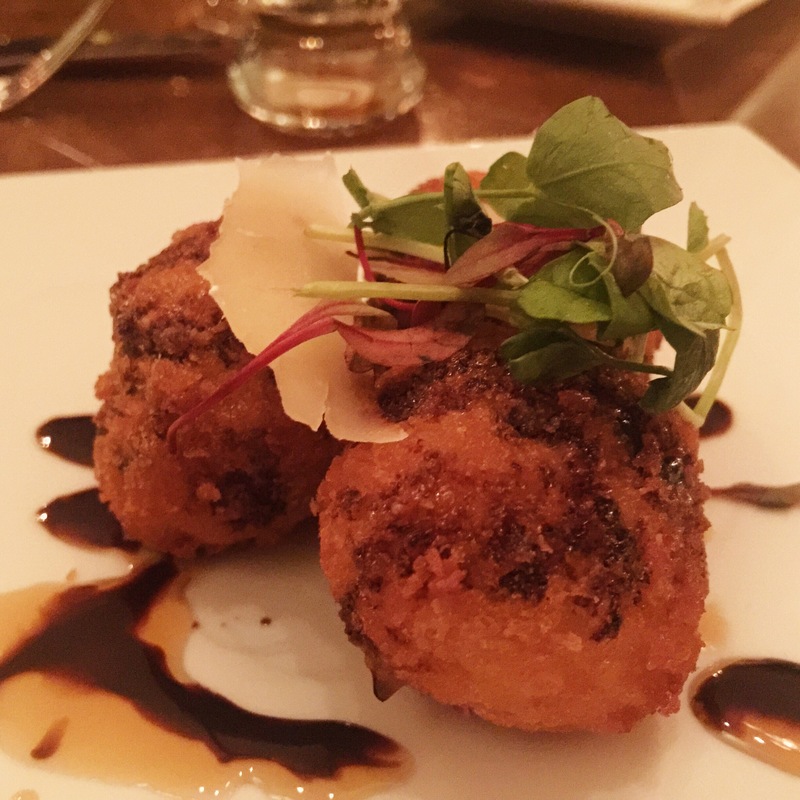 Next up were the arancini (rice balls). These were incredible. They came with a honey balsamic drizzle, which added such a nice sweetness. The fried breading also had some kind of amazing sweetness to it, as well. And while fried things can sometimes become dense and heavy and greasy, these were the perfect amount of “fried” where they were crispy and rich but still sort of light. The filling was like magical cheesy risotto, and I loved the touch of roasted mushrooms inside to give them a little extra earthy flavor. Again, we saw the completely useless microgreens on top, but I didn’t really care. At this point, Jason and I also needed some fresh cocktails, so I went with the Stranahan’s Diamond Manhattan, and Jason did a classic Old Fashioned with Basil Hayden. As usual, the drinks were absolute perfection. No nonessential garnishes here, just perfectly balanced magic in a glass. 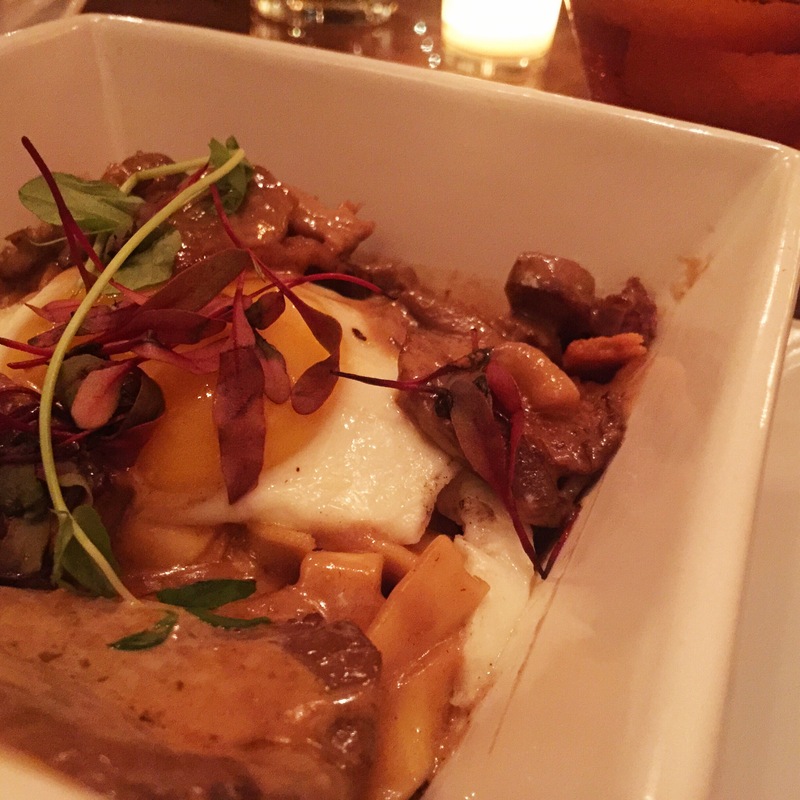 Next up was the pappardelle: cognac cream sauce, basted egg, oyster mushrooms, filet mignon, and parmesan crisp. This was delicious. The creamy booziness of the sauce, combined with the runny yolk of the egg was spot on. The filet mignon and mushrooms looked kind of similar (darker shreds covered in sauce) but each had such beautiful distinct flavor and texture, it was nice to be surprised by them throughout the dish. Again the greens were present, and annoying to eat around. I thought the parmesan crisps seemed like a good idea, but I didn’t love them – they had too strong of a flavor for me. The pasta was cooked well – it could have been slightly more al dente. Overall this was a definite winner – I’m sort of craving it now as I write this, actually. Next was Ahi Tuna: Jason was totally obsessed with this, and I thought it was pretty delicious, too. The sear on the tuna was perfect. The salty and fragrant crispy rice cake underneath was a nice balance texturally. The miso and miran in the dish gave it that perfect salty/sweet combo that I love, with a hint of spice from some subtle wasabi. I’m always a big fan of bok choy, which was done well, too. Desserts at Bin 5 have always been extra special, and thankfully have not been altered along with the rest of the menu. To add to the warmth and coziness of this special little space, Mr. Ippolito shares desserts made by his mother and sister with his guests; I basically feel like we’re part of the family now. 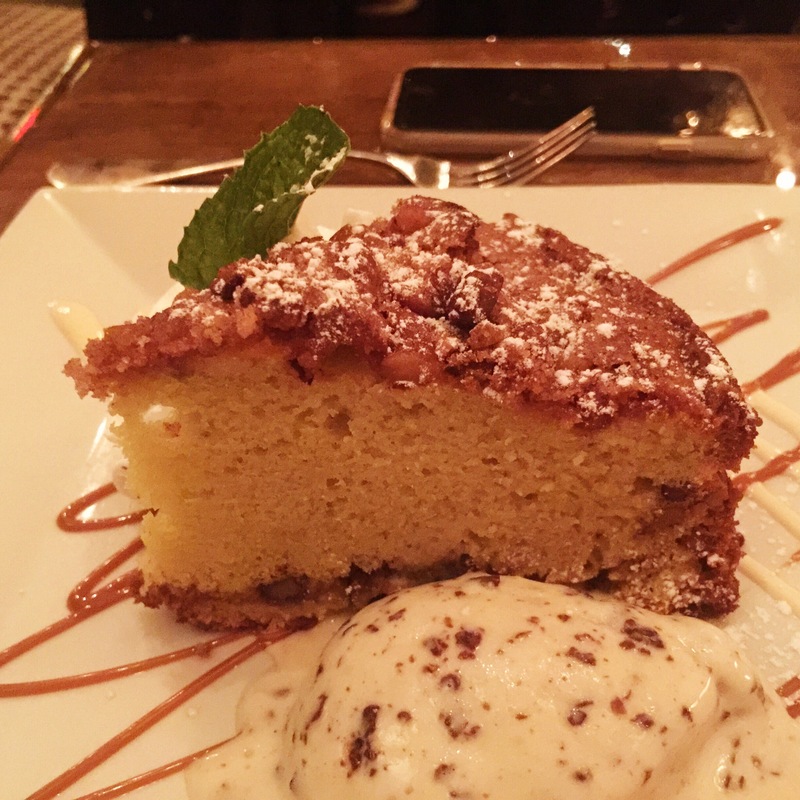 I have had the pistachio walnut cake before, and I was so relieved to see that it was one of the desserts chosen for us last night. It is amazing. It looks so simple; it probably is so simple. But it’s just so good. There’s this nutty crumbly crust on the bottom, almost like an upside down crumb cake. And it’s light and fluffy and feels like it is fresh out of the oven every time I have it. I’m in love with this cake. 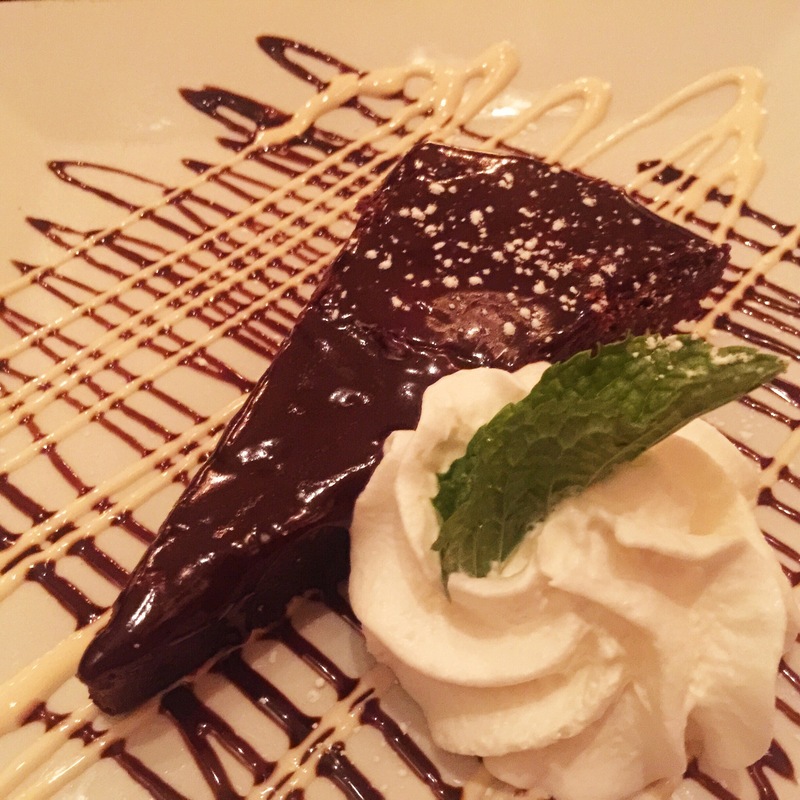 Then I cheated on the pistachio walnut cake with this bad boy: the chocolate torte. Super salty, super rich and super fudgey. I’m upset that my stomach can only hold so much: What does the chocolate peanut butter crumb cake taste like? What about the rainbow cookies?! I need to try them all. For an after dinner drink Mr. Ippolito presented us each with a very special glass of green chartreuse. It was one of the strongest sips of alcohol I’ve ever tasted (I felt like I was instantly roofied), but so interesting and complex and beautiful. Mr. Ippolito’s appreciation for these kinds of things help Bin 5 to really stand out: he is constantly exploring new liquors and varieties of gins and bourbons, and sharing his exploration with his customers. “What do you think of it?” he asked, really wanting to hear what we had to say, and excitedly sharing his opinions, too. During dessert Chef Steven came out of the kitchen to quickly greet us, which was nice. What was most interesting about this meal, for me, was that in doing the tasting menu I got a lot of dishes that I never would have ordered for myself: I wouldn’t have gone with the burrata, the salad, or the tuna, and instead would have probably done the grilled octopus, pork belly tacos, and the cornish hen or duck entree. But I really thoroughly enjoyed trying things outside of my comfort zone: they were all so delicious. And now I’m left even more excited to come back for everything else. Lose the extra greens on top of each dish; find a garnish that serves a purpose or don’t have any at all – the food is beautiful enough on its own. Chill the salad plates – so simple and will make such a big difference. Chop the salad components up a little more to make them easily accessible for each bite. Barware… I didn’t mention this before, because I was too busy obsessing over the quality of the cocktails: I’m a weirdo, but I hated having my Negroni Fizz sitting in the same glass as my water glass. To me, that made it look like some cheap fruity drink, which it most certainly was not. And I also hate the short stemless martini glass for the Manhattan and the Foxeye; it’s completely my personal opinion, but I just think they’re cheesy. I love super classic cocktail glasses: classic coupes or minners glasses for specialty cocktails served up, and classic rocks glasses for the other stuff (what you used for Jason’s Old Fashioned was perfect). I feel like for a place so focused on perfect classic cocktails, you should have perfect classic cocktail glasses. Overall, Bin 5 is off to a seriously great new beginning. While there are still a few minor kinks to work out, none of them significantly affected the amazing meal Jason and I shared there. Four stars, for now, but I’m confident that they’re well on the way to a five star rating, soon. Mr. Ippolito and his wonderful staff should be proud of themselves, and should feel confident moving forward. To the team at Bin 5, as you encounter each success, don’t forget the special little things that got you there: a warm greeting for and conversation with each customer, and passion. You can learn to chill your plates, switch your glassware, and perfect your garnishes, but the things that matter most – the love in the food and drinks – is already in each bite and every sip. Well done.